Have you seen Maxie the Musical? Well if not you probably need to rush because the show is closing tomorrow. I want to give this show an artsy fartsy review but I guess the easiest way to convince everyone is to just say that it is a fun show and you will definitely enjoy it. Maxie the Musical is a Stage and musical Adaptaion of the critically acclaimed indipendent film "Ang Pagdadalaga ni Maximo Oliveros" written by Michiko Yamamoto and Directed by Auraeus Solito in 2005. 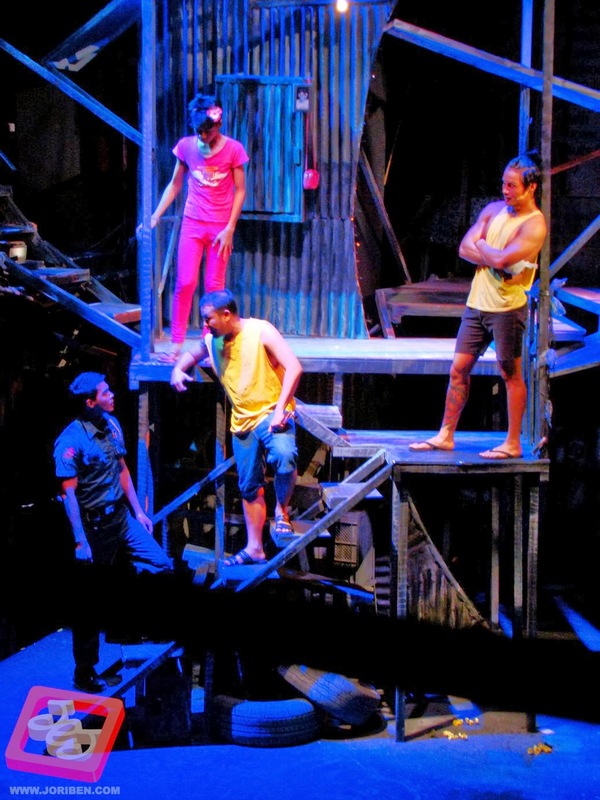 It tells a story about a young gay boy and his life in the slums with his father and brothers. Think this story is like any other gay oriented stories? Think again because, one unique quality of this movie is his family accepts him despite the fact that they are all straight men. This is the movie/play's main strength. Here gays are not discriminated but loved and respected. As a play, Maxie the Musical preserves the mood and texture of source material. In the set design alone, it is the complete opposite of what you will expect from a gay oriented musical play. No Pink at all. The design is dark, rusty and dirty. I also applaud how the flamboyant moments compliment the gritty realities of life. The show is not as strong or compelling as most of the play I've seen but it is entertaining enough for me to enjoy. Of course it is also a treat to see some of the magnificent names in theater community joining the cast. Names such as Nazer Salcedo (Paco), Al Gatmaitan (Boy), Jay Gonzaga (Bogs) and Jules Dela Paz to name a few. Names synonymous to excellence which makes this show a must watch. The title role played by Jayvhot Galang (Maxie) also deserves a high five for giving a remarkable performance in his professional theater debut. And also before I forgot, this play is directed by one of my favorite Theater Director, Dexter M. Santos who are famous from some of his magnificent projects sych as Rizal X and Orosman at Zafira. So there. I hope I gave you enough reason to see it. I promise that you will never regret it. You still have 2 shows tomorrow. There's a 3pm and 8pm shows. For 3pm shows you can call (0917) 518-3654 and for 8pm call (0917) 842-7346. For more details you can contact Marvin on this number: (0917) 533-6267. 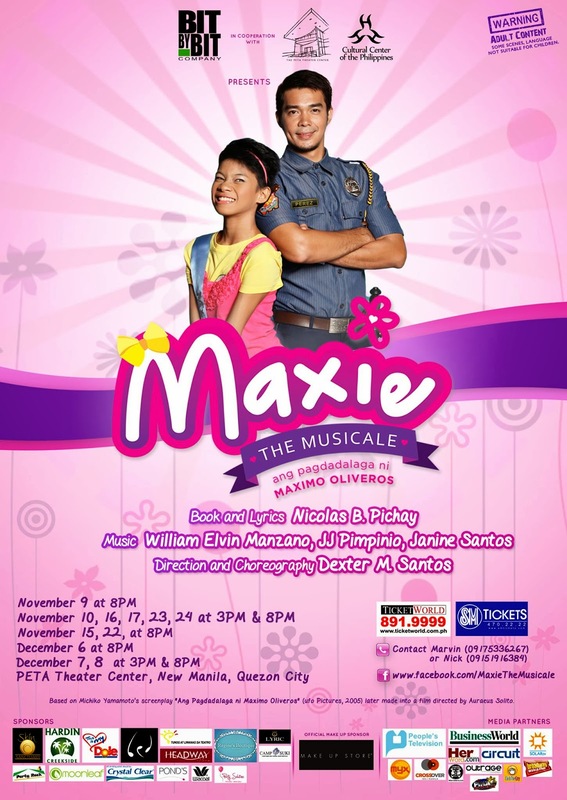 Maxie the Musicale is playing at the PETA Theater, New Manila, Quezon City, brought to us by Bit by Bit Company.